Travel is meant to be shared. And what could be better than sharing the romance of travel with your one-and-only love? Or beginning your journey as a couple with a destination wedding? At Perillo Tours, we can fulfill all of your romantic travel fantasies, whether you want to get married at a vineyard in Tuscany or renew your vows on a beach in Costa Rica. 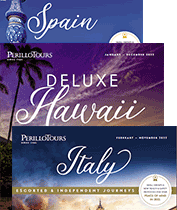 Perillo Tours specializes in destination weddings, vow renewals, honeymoons and anniversary trips. Whether you want your experience to be private or want to bring your family and friends along to witness your love, we can make your wildest romantic dreams come true in Italy, Costa Rica, Hawaii and Greece. We will forward the perfect sample programs to suit your exact specifications.